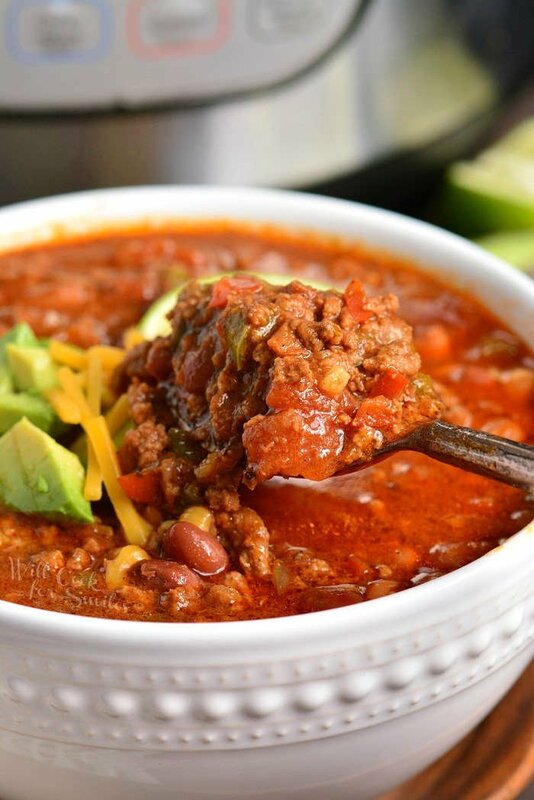 Chili is an amazing comfort food anytime, and not just in the winter. Delicious combination of ground beef, beans, veggies, and lots of spices will make your mouth water as the aroma fills the house. 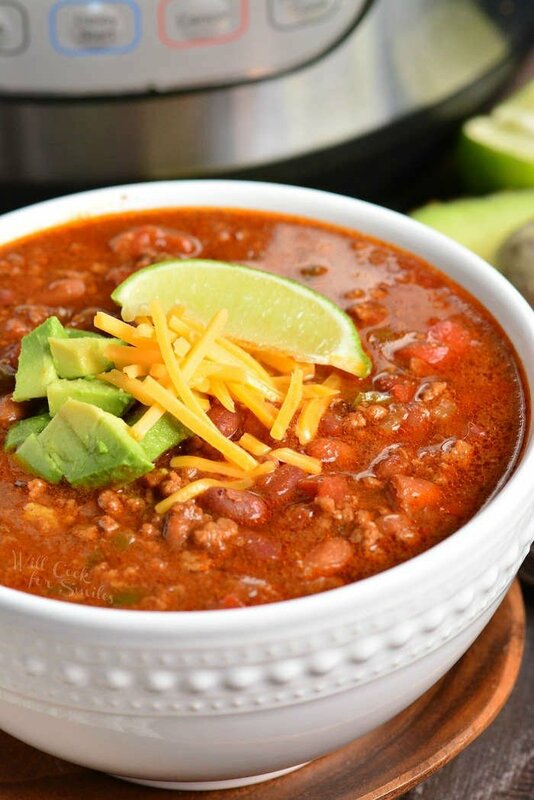 This chili recipe is easily made in an Instant Pot and will be ready to devour in less than an hour. You can also try my stove-top Chili recipe, which never disappoints. Don’t forget to make some homemade cornbread or jalapeno cheddar biscuits to go with your chili. Every time the temperatures outside gets a little low, it’s chili time at our house. It doesn’t even have to be a big drop in the temperature, just a few degrees is excuse enough for us. Since my whole family loves chili, I make it pretty often. When I make chili on stove-top, it takes a good couple of hours because I like to give meat a lot of time to stew and get tender. Cooking chili in a Crock Pot it takes several hours, of course. 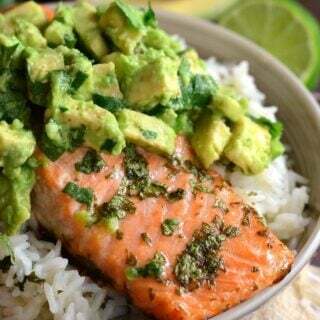 That’s why I’ve adjusted my recipe to cook it in an Instant Pot. In less than an hour, we have flavorful, tender chili to enjoy. 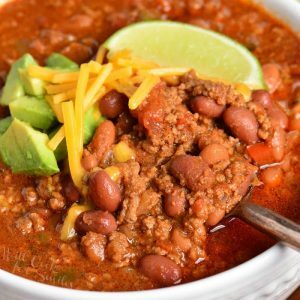 The biggest difference that I found between making chili on stove-top and in an Instant Pot is that chili has a little more liquid when cooked in Instant Pot. Since liquid doesn’t cook out and evaporate in a pressure cooker like it does on stove-top, more liquid remains in the chili. I actually don’t mind our chili to be a little soupier but I do add less liquid when I make it in a pressure cooker. Do not try to get rid of all liquids though. 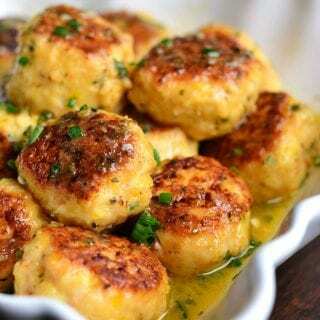 A pressure cooker has to have at least 1 cup of thin liquid to cook the food. So I’ve cut down beef stock to 1/2 cup. Combined with juices from sauteing meet and vegetables and juice in canned tomatoes, 1/2 cup of beef stock is enough to cook the chili in the Instant Pot. Much like on the stove-top, veggies and ground beef needs to be sauteed first. One difference is that I don’t bother taking the beef in and out but cook veggies and then add beef right to veggies. Prep your ingredients first by dicing onion, bell peppers, jalapeno pepper, and tomatoes. Open all the cans and drain off bean liquid. Peel garlic. TIP: if you want chili to be spicier, leave jalapeno seeds in. If you do not want it to be too spicy, choose younger jalapeno peppers without any lines on the skin and take out all seeds and membrane out of jalapeno. 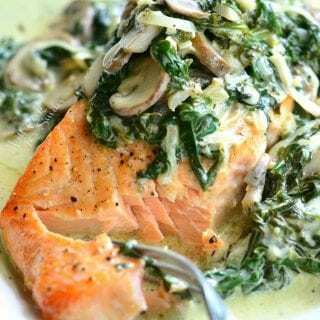 Set Instant Pot to “Saute” setting and give it a couple of minutes to warm up. Add some oil to the pot and saute onions and bell peppers until softened. Smash and mince garlic and add it to the pot as well. Let it saute until fragrant and then, add tomatoes and jalapeno. Stir everything and let it saute for a few minutes. Add ground beef to the pot, break it apart and let it cook for a couple of minutes. Stir well and try to break up all the lumps at it’s sauteing. Once ground beef is mostly browned, add beans, canned tomatoes, tomato sauce, beef stock, and all the seasoning. Stir everything very well. Close the lid and latch it. Make sure to turn the valve to “seal” and set pressure cooker to “Beans/Chili.” If your pressure cooker does not have that setting, set it to cook on high pressure for 30 minutes. Let the pressure cooker do a natural release for about 10 minutes and then carefully do a quick release. Some pressure cookers have many preset cook time settings. Those may include buttons like “soup/broth,” “meat/stew,” “bean/chili,” and many others. These settings are recommended times and level of pressure for cooking different types of food. Bean/Chili setting is set to cook for 30 minutes on high pressure. If your pressure cooker does not have this preset setting, you can set that manually by selecting “pressure cook” on high for 30 minutes. If you want to freeze leftover chili, you can absolutely do that. 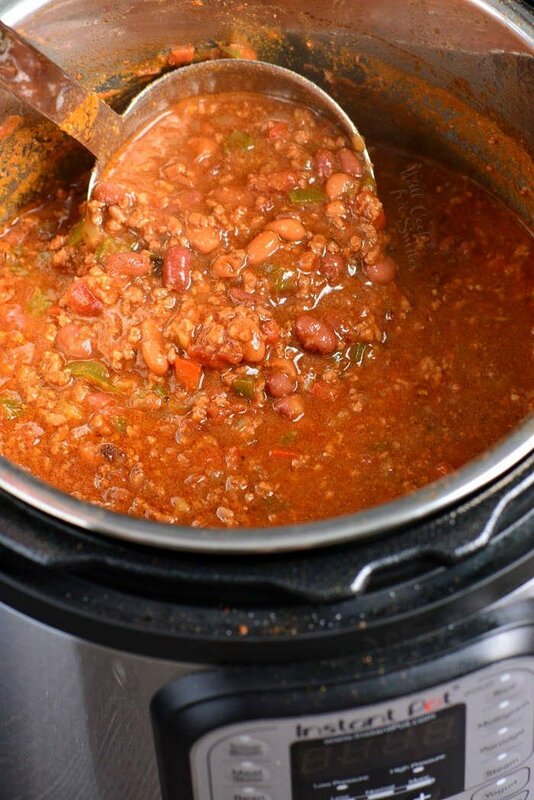 To thaw, pull the frozen bag of chili from the freezer into the refrigerator and let it slow-thaw overnight. 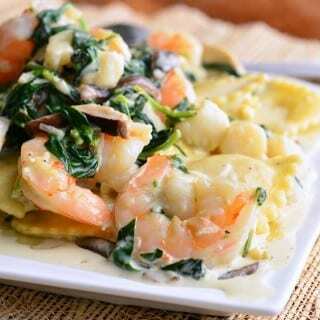 Reheat it in the microwave or on stove-top over medium heat. 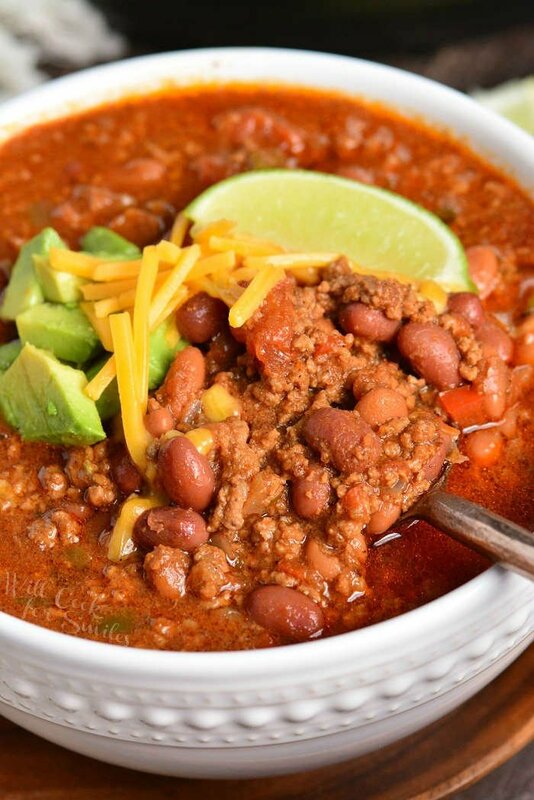 If you don’t feel like freezing chili, you can use leftovers in a few other recipes. Try topping off nachos with some chili. For simple nachos, melt cheese over tortilla chips and then spoon some chili over the top. 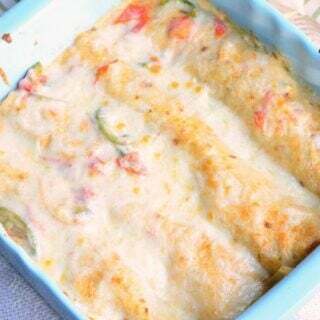 Add some fresh tomatoes, lettuce, and green onion on top. Chili cheese fries is always a crowd pleaser. Bake or fry some French Fries until crispy and then gather it in an oven-safe bowl. Melt some cheese over the top and then top cheesy fries with some chili. Mix chili with some queso dip to make a delicious chili cheese dip. 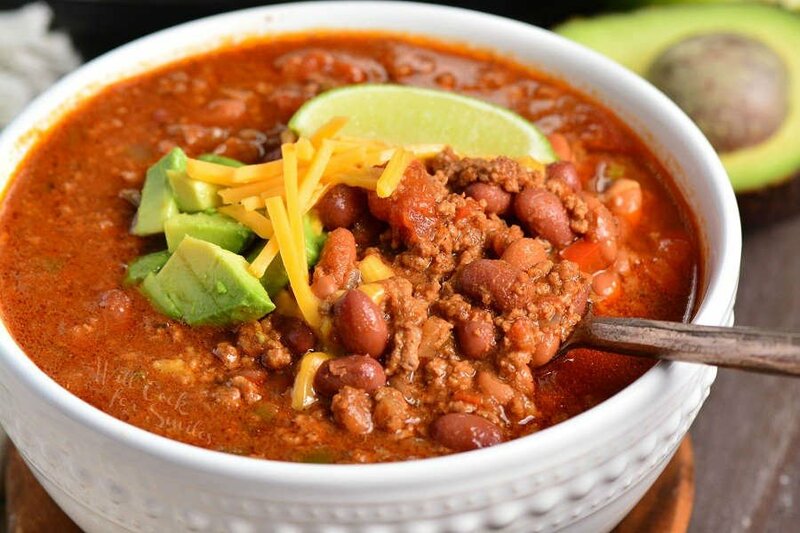 Delicious Chili made In an Instant Pot with ground beef, beans, veggies, and lots of spices. 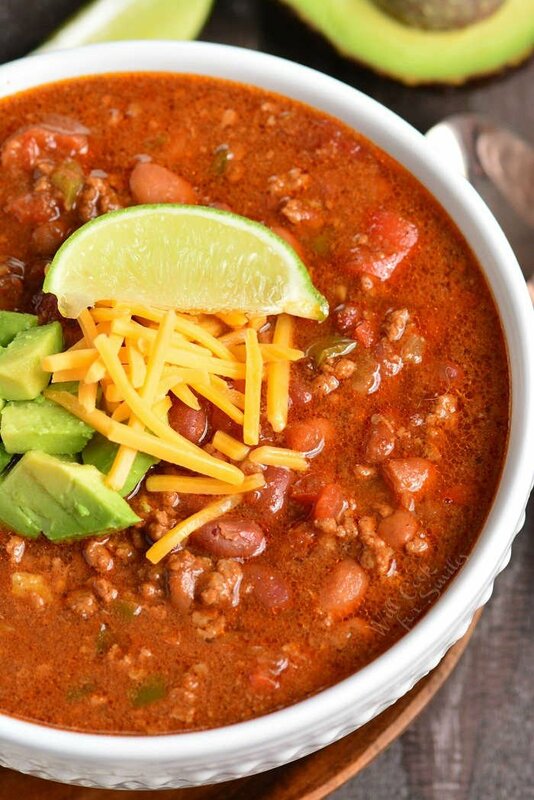 This chili recipe is easily made less than an hour. Prep your ingredients first by dicing onion, bell peppers, jalapeno peppers, and tomatoes. Open all the cans and drain off bean liquid. Peel garlic. This looks like a calorie bomb. Can I exclude beans and then make it? Will it change the taste or take out the essence of the recipe? But yes, you can go down to only 1 can of beans of skip it all together and just double the veggies. 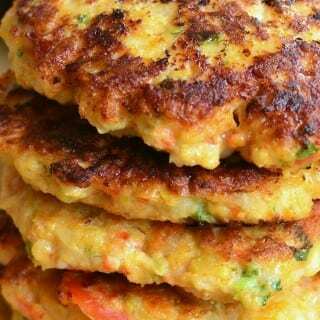 You can also add some bell peppers to pack it more with veggies.